Get ready. Lycée Français de Chicago Fall invites all Chicagoans to indulge in a true French marchéth annual Fall French Market (550 W. Irving Park at Lake Shore Drive) with cooking demonstrations from Chicago-area chefs, specialty and artisan goods from more than 75 vendors, an anniversary cake cutting, and supervised activities for children. Opening with a special preview party 7 p.m. Friday, November 7 attendees will be the first to peruse the goods from participating vendors, while enjoying appetizers, beverages and live music followed by a cake cutting ceremony marking its 10-year anniversary as well as the 10th anniversary of the Fall French Market. 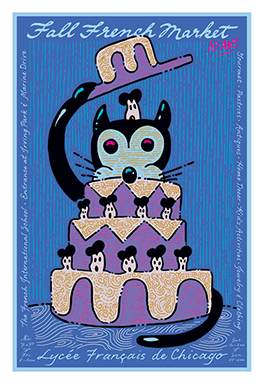 The benefit party tickets are $35 in advance and $45 at the door. On Saturday, Nov. 8, and Sunday, Nov. 9, join top local chefs and proprietors from Bistrot Zinc, Chez Moi, Cook au Vin, The Chopping Block, Metropolis Coffee, Patisserie Coralie, Saveur Cuisine, Spacca Napoli Pizzeria, and Troquet River North for cooking demonstrations, including heavenly pastries and exquisite gourmet French cuisine. Attendees will be able to browse a unique selection of goods from local vendors, including specialty foods, art, clothing, accessories, home decor, antiques, and more. In addition, The Children’s Pavilion has activities ranging from soccer, yoga, karate, and theater and art workshops. Daily admission for the Fall French Market is $5 per person for adults and children admission is complimentary. 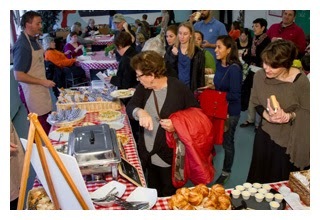 Tickets for the Lycée Français de Chicago Fall French Market are available for purchase at discounted rates in advance through Thursday, November 6 at www.FallFrenchMarket.com/buy-tickets.html. All proceeds from the Fall French Market are dedicated to supporting student programs and resources at Lycée Français de Chicago, as well as financial aid and extracurricular opportunities. For additional information on the Fall French Market visit www.FallFrenchMarket.com. Immerse yourself in culinary delight and artistic flair and join affluent professionals, entrepreneurs, media, sports and entertainment personas for Compassion, Fashion & Cocktails 2014, a charity event celebrating fashion and philanthropy that will raise money and awareness for the charities Stop Traffick, "Supporting victims of human trafficking", and Gaples Institute for Integrative Cardiology, "Advancing Natural Options for Optimal Health". Not only will you get to mingle with the who’s who of Chicago, but you will also get to enjoy great cocktails and a fashion show. The event is being held on Thursday, October 30th, 2014, at The Godfrey Hotel Chicago | I|O Urban Roofscape, 127 W. Huron St. at LaSalle St., Chicago, IL. 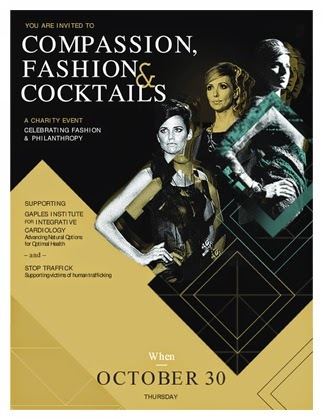 There will be a private cocktail reception from 5:30 -7:30 p.m. hosted by Svedka, followed by the runway fashion show, by Eskell, at 8 p.m.
silent auction, a raffle, and gift bags will be distributed to the first 100 guests to arrive. The Gaples institute for integrative cardiology is an educational nonprofit working to improve the health of all Americans by emphasizing the role of nutrition and lifestyle-combined with the best in conventional medicine. Innovative educational program are conducted across the country, from presentations to mothers of children in head start to workshops for physicians that combine nutrition education with hands on cooking instruction. Our vision is to make nutrition a cornerstone of health care. Stop Traffick is a Chicago-­based, grassroots effort to raise funds for victims of human trafficking and to spread awareness about this critical human rights issue. practical legal advice while concurrently addressing their pressing business concerns. auction, a raffle, and gift bags will be distributed to the first 100 guests to arrive. and to spread awareness about this critical human rights issue. Cantina de la Granja (5025 N. Clark) is hosting a Green City Market benefit on October 29 from 6:30 p.m. to 8:30 p.m. A Modern Mexican restaurant opening in early 2015 in Chicago's Andersonville neighborhood, Cantina de la Granja's vision is to innovate traditional and regional Mexican dishes through modern culinary techniques while keeping flavors authentic. Cantina de la Granja will provide a Midwest farm-to-table experience by sourcing from a hyper-local group of farmers and growers, with 70% to 75% of the ingredients including meats, seafood and vegetables, sourced within 200 miles of Chicago. The owner is Mark Robertson (Uptown Management Group - Crew Bar & Grill, Sofo Tap). The exec chef is Diana Davila. In addition, Cantina de la Granja will feature a 1,400 square foot rooftop garden designed to produce 1,000 pounds of ingredients, not only to be use in the restaurant, but also as a source to prototype varietals such as peppers that will continue to be harvested at local farms. All proceeds of ticket sales will be donated to Green City Market. The tickets are all inclusive and just $60. Purchase tickets on line here: http://www.brownpapertickets.com/event/886552. Photo description: Taco de Cabrito Adobado on flour tortilla with ancient herbs and cacao. Taco of slow clay roasted goat in vinegar, dried chilies, citrus and coffee on a made by my hand, family recipe of Chihuahua flour tortilla. To finish chopped onions and obscure Mexican herbs hoja santa & papalo and grated cacao. Buena Beach Bar & Grill is challenging you to create the most outrageous Jack-O-Lantern. Whether it be scary, humorous or a chip off the old block, bring your knife skills to the newgastropub at 4250 N. Marine Dr. this Thursday from 5 p.m. to 11 p.m. and carve away. Five dollars will get you a pumpkin. Bring your design and join neighbors and friends in creating your own signature pumpkin. Pumpkins will be on display through Halloween. Judging will culminate at Buena Beach’s Halloween Costume Party 6 p.m. October 31. The costume contest entry fee is $20 which includes two drink tickets (house drinks, house wine and tap beer); costumed characters dining receive a complimentary dessert with purchase of an entree. First prize costumed winner will receive $50. Note: The Walking Dead Fans - beginning this Sunday, Buena Beach will host AMC's "The Walking Dead" viewing parties beginning at 8 a.m. Special zombie drinks will be featured. Dinner will be available until 10 p.m.
Buena Beach Bar & Grill, located in Imperial Towers at 4250 N. Marine Drive in Chicago (773-880-9115) is an eclectic American casual gastropub. 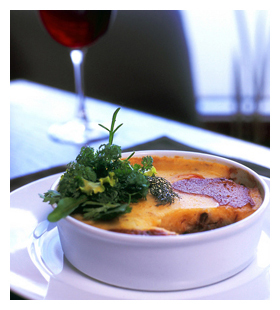 Dinner is served from 5 to 10 p.m., Monday through Thursday, and 5 to 11 p.m., Friday and Saturday. Weekend Brunch is served on Saturday and Sunday from 9:30 a.m. to 2 p.m. Dinner service on Sunday goes until 9 p.m. Buena Beach Bar & Grill accepts all major cards. Limited parking is available in the garage at 4250 N. Marine Drive. For more information, please contact the restaurant at (773) 880-9115. Looking for a great side dish for your Thanksgiving dinner? Look no more. 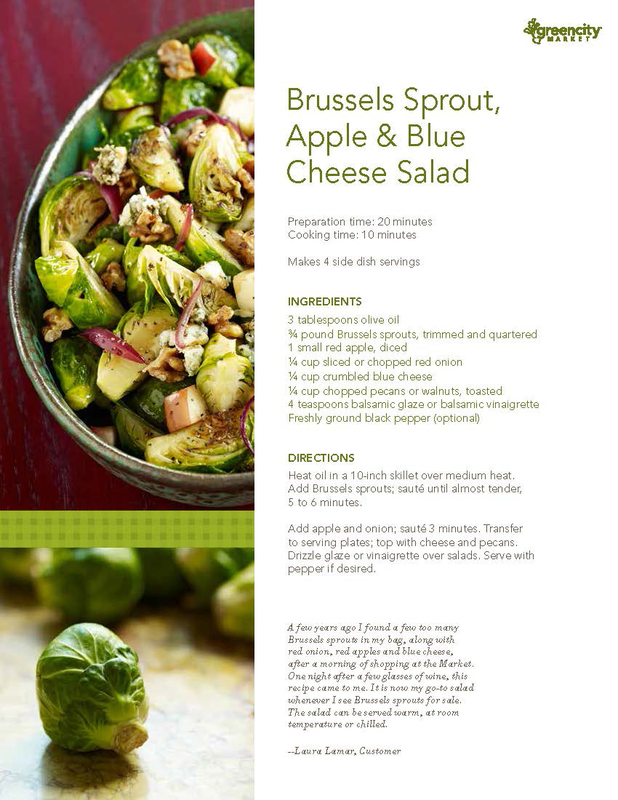 Green City Market shares this delicious Brussels Sprouts recipe from its new Green City Market Cookbook. Better yet, give your host a copy of the cookbook, available at Green City Market or on its website. It's a gift your host will cherish for years to come. Just because winter is fast approaching, it doesn't mean that you can't still find fresh, locally grown produce, fruit and food in Chicago thanks to Green City Market's indoor operations. Green City Market moves indoors to the Peggy Notebaert Nature Museum at 2430 N. Cannon Dr. on November 8. Look for vendors toting organic baked goods, meats, poultry, fruits, vegetables, dairy products and more. Save these dates, winter markets will be held: November 1, 8, 15 and 22; December 6 and 20; January 24; February 7 and 21; March 7 and 21, and April 4 and 18. From 8 a.m. to 1 p.m., Chicago foodies, chefs and restaurateurs will head to the second floor of the Peggy Notebaert Nature Museum to celebrate sustainable farming practices and good eats, where it will remain through the winter months. The market will return to its outdoor location in Lincoln Park in May. Visit www.greencitymarket.org for the list of farmers and more details. 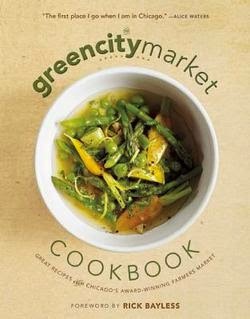 The Green City Market's Cookbook ($24.95) will be available for purchase. The book features seasonal 88 recipes from local celebrated chefs and frequent Green City shoppers and is the perfect food gift for the food enthusiast in your life, especially as a host/hostess gift for Thanksgiving or Christmas. Since its debut in 1998, the Green City Market has been committed to educating Chicagoans about sustainable agricultural practices and connecting consumers with area farmers that follow these practices. Green City Market has consistently been named in the top 10 of the nation's best farmers markets by national publications such as Bon Appetit, Travel & Leisure, Forbes, Shape, CNN, Huffington Post and US News, among others. The organization recently published its first cookbook, The Green City Market Cookbook, featuring recipes from chefs, restaurateurs and market customers. The cookbook is available at both Green City Market locations as well as on its website. Treat your family to a fabulous home cooked Thanksgiving meal courtesy of chefs Sarah Stegner and George Bumbaris of Northbrook’s Prairie Grass Cafe (601 Skokie Blvd., Northbrook, IL 847-205-44330. Advance orders are now being accepted for their ever popular Thanksgiving To Go and must be made by November 20 for pickup at Prairie Grass Cafe between noon and 3 p.m. on November 27. Start your celebratory feast with homemade Butternut Squash Soup (quart serving 4, $20); Jumbo Cocktail Shrimp with Homemade Horseradish Sauce ($48 per dozen); Organic Mixed Green Salad with Shaved Parmesan, Pumpkin Seeds and Pomegranate (serves 6 to 8, $45); and Cut Vegetable Assortment with Amish Blue Cheese Dip (serves 6 to 8, $35). Your family and friends will be delighted with the juicy Roasted Turkey with Gravy (whole services 10-14 people, $110; half serves 5-7 people, $60); Apple Sage Stuffing (quart serving 4-6 servings, $14); and homemade Sausage and Giblet Stuffing (quart serving 4-6 people, $24). Sides include Yukon Gold Mashed Potatoes (Pint serving 2 to 3, $7; Quart serving 4 to 6, $14); Sweet Potato and Butternut Squash Puree (Pint serving 2 to 3, $8; Quart serving 4 to 6, $16); Sautéed Green Beans (Pint serving 2 to 3, $8; Quart serving 4 to 6, $16); Brussels Sprouts with Bacon and Chestnuts (Pint serving 2 to 3, $12; Quart serving 4 to 6, $24), and Homemade Cranberry Sauce (Pint serving 2 to 5, $8; Quart serving 6 to 10, $16). It may be a cliché but save room for dessert. Prairie Grass Cafe’s locally sourced homemade Pumpkin Pie ($24/pie, 6 slices) and Sarah’s famous "Mom’s Pecan Pie" ($24/pie, 6 slices) with pumpkins and pecans from Three Sisters Garden are the perfect ending to a terrific feast. For the chocolate cake fans in your family, don’t pass up Prairie Grass Cafe’s decadent Double Chocolate Cake (serving up 10-12, $50). Prairie Grass Cafe supports local farmers: pumpkins provided by "Three Sisters Garden", pork for sausage by "Maple Creek Farm", apples by "Nichols Farm", and pecans by "Three Sisters Garden". Green City Market's final Club Sprouts event takes place 8 a.m. to noon Saturday, October 25. 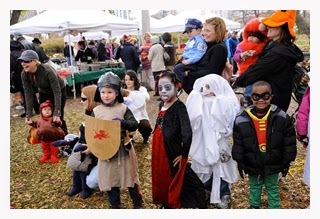 The Club Sprouts Halloween Party draws hundreds of costumed children. Miss Jamie from the Farm, a children's musician, performs at 10 a.m.
Miss Jamie and her puppet friends from the farm take the audience on a magical barnyard adventure in a sing-along, dance-along show that's fun for kids and grownups alike. The interactive performance features well-known farm songs as well as original tunes like "Happy Chickens Lay Yummy Eggs" and "Keepin' it Pesticide Free," and teaches healthy eating and responsible farming in a fun way that leaves everyone stompin' their boots and hollerin' for more. 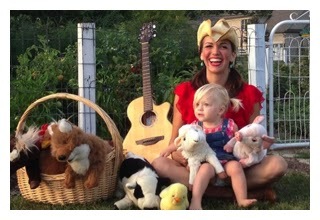 Sing, dance, laugh and learn with Miss Jamie and her farmyard friends! Join the fun. Participants will decorate pumpkins, make Halloween themed snacks and participate in a costume contest at 11 a.m. at the Lincoln Park location. The event is free and open to the public. Green City Market’s 2014 outdoor season runs May 3 through October 25, Wednesdays and Saturdays from 7am to 1pm. The market is located at the south end of Lincoln Park between Clark and Stockton Drive (approximately 1790 N. Clark). Discounted parking is available for $10.00 for under two hours with validation in the Chicago Historical Museum parking lot off of Stockton Drive. Pick up a validation ticket at the Market info booth. (for validation, patron must make a minimum $5 purchase at the market). There is a special $5 Early Bird parking rate on Wednesdays for one hour between 7am-9am.